Below is when I left sports art and entered FINE ARTS in "Hyper- Realism" realm of painting ( and right before I went into Fantasy Art) . The definitions of the art are most important to me but to hear the viewers interpretations were most intriguing!! 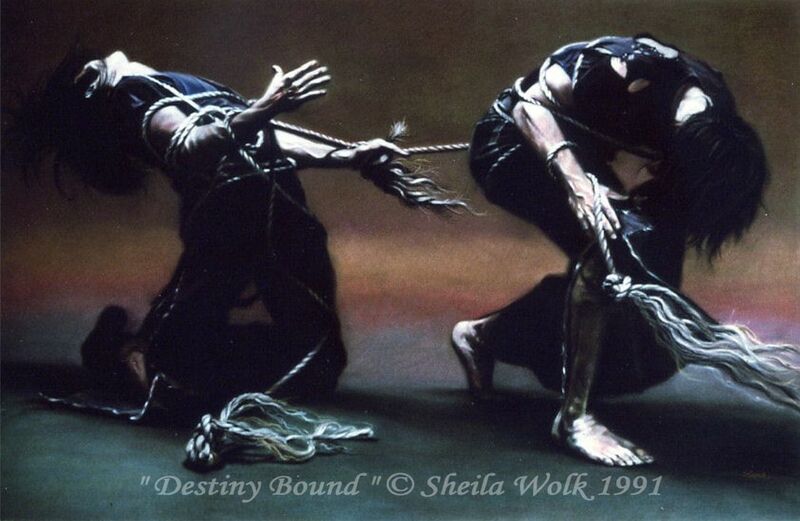 ​"Destiny Bound" This is man interacting with himself - the ropes signify problems we. the people of planet earth, have put upon ourselves. The circular rope on lower left signifies our universe. The rope unraveling and being held in the hand in the middle of the painting represents our holding on to our problems. Will we need to hold on to. it. or let it go; to surrender to the problem? The ropes (right side) represent hope - the future. The colors are also representational - the deep green on the bottom represents our earth. The red means danger; the yellow means caution; the brown (sepia) means pollution. So the painting reads like this - mankind is holding onto the position he has made for himself on planet earth. We have recognized our mistakes - but will our next step be to correct and reconquer our situation or surrender to it? We are -"Destiny Bound". 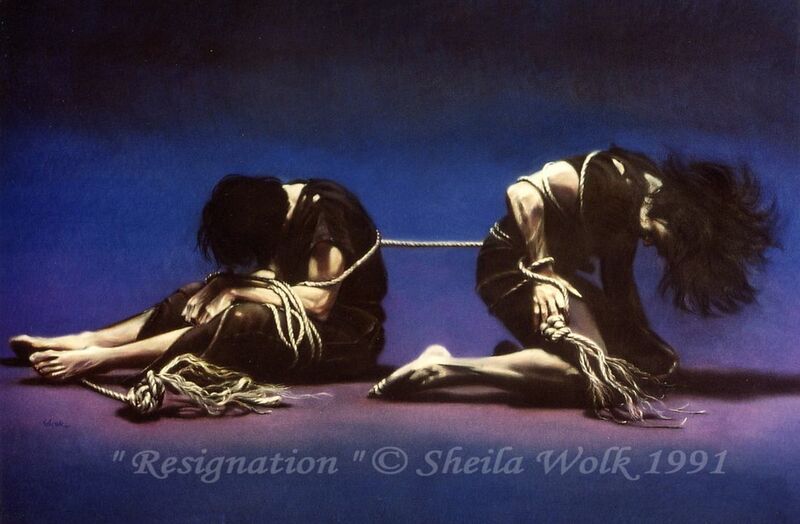 "Resignation" The sister picture to "Destiny Bound". Again the ropes represent our earth's problems • mankind made and man's interaction with himself. The difference this time is in the color - and the positions. The man on the left is sitting despondent, almost defeated. The rope is taut in the middle - as if we drag our problems around with ourselves - or could it be that we are holding ourselves back from moving on. There is one last struggle shown by the character on the right. Is he rising or falling? We hope he's rising. The ropes rain down • brittle - is this defeat? The color blue represents cold; and red (blood) mixed with the blue equals purple. The breath of hope -whether it's our first breath or last • Oh, what we can do with one more opportunity, one more chance. "The Weanling" As a child weans himself from his mother's milk - her breast - so man learns to wean himself from his own problems. The only person - the last person to lift him from his problem - is himself. This character is in the embryo position as within the womb. Crouched, he is embarrassed by his aloneness, despair and fear. Surrounding him is himself-helping himself up with an open hand. ​ This is our first lesson in life and our last deed in death. We live by picking ourselves up and die by letting ourselves go. We are the masters of our own tiny individual universes known as man -we are the Weanlings. "Individuation" Are we out, wanting to stay within? Or are we in. wanting to come out? Either way, it's mankind entrapping himself in restraint. And so it is with truth. We want to expose the truth - but others are offended or afraid of hearing it. So we caution or stop ourselves from giving it (hands folded) and yet, our minds and hearts want to gift it. ​ "My Legacy" This is man giving himself unconditionally. He has placed himself in his own hands and is carefully handing himself to you. With this kind of gift there is no sight, no smell, no hearing, no question. 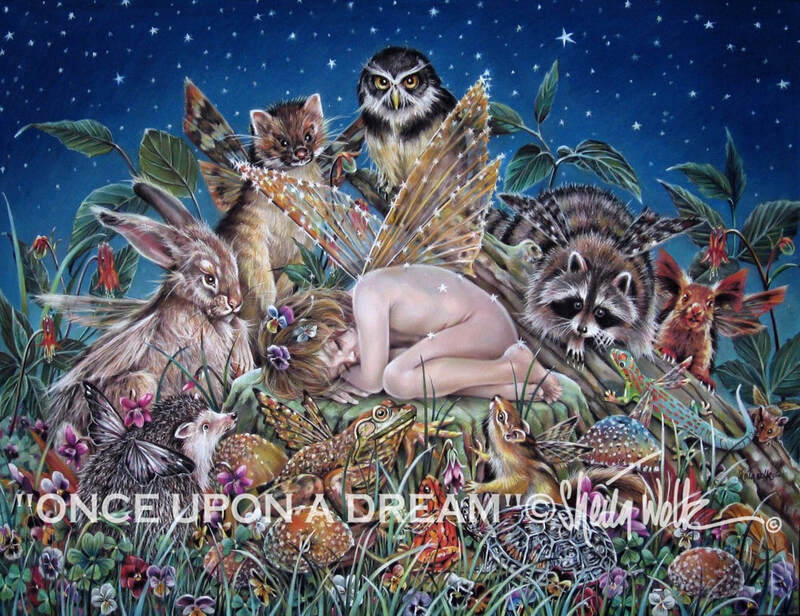 In my own personal life this represents my feelings when a painting is done, I hand it over to the world - my gift to you dear planet - I give it to you with love - unconditionally! Please take good care of it, this is my child. "Ode To Butoh I" These are two dances in one. The large dancer in orange represents the defiance and acceptance of the devil -to mock him. But to mock him - you must recognize him. This symbol of mocking is to say • yes, I know you exist, but you can't have me. I dare to imitate you in costume, to dance like you in movement, but I can disrobe or be still to show you that I can shed me of you -and underneath is goodness - my power - my strength that overrules you. The smaller characters in white paint represent defiance of fear; thus fear can alter or prevent life from living. These men hang from high mountains, cliffs or buildings to show grace and power and strength over fear. 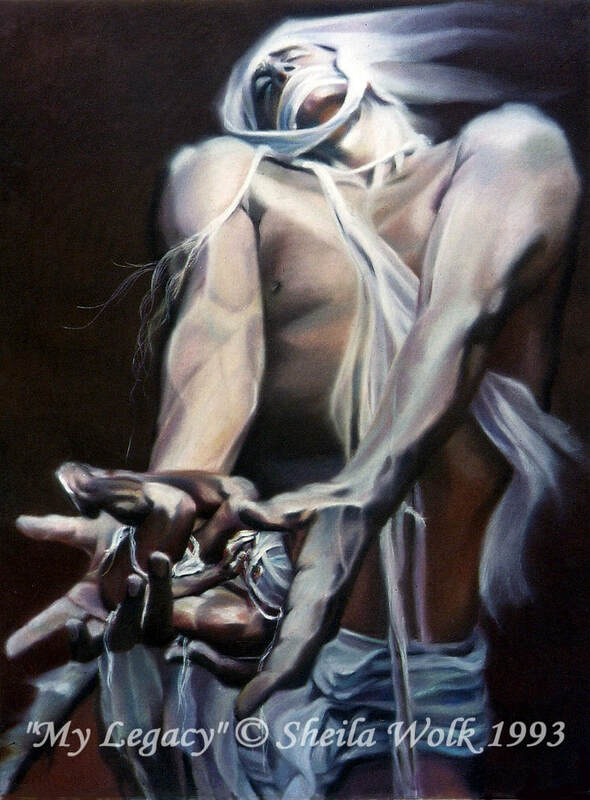 My painting incorporates two separate Butoh's and is also a dedication piece to a Butoh dancer who lost his life (here in New York) by falling from the high rise building when his rope broke. There was a great deal of irony (to me) in this Butoh's dance and death. ​ A truth takes place here which cannot go unnoticed, unpainted, or forgotten. So I bring to you the dance of fearless men held by the power of goodness - and the master gives one back to our planet, and takes one for himself (represented by the broken and shredded rope). All is well in Heaven and on Earth. Please enjoy this video I made of many of my fantasy paintings. I work with Rembrandt Soft Pastels on Acid Free PH balanced paper. in many Museums and with Private Collectors. 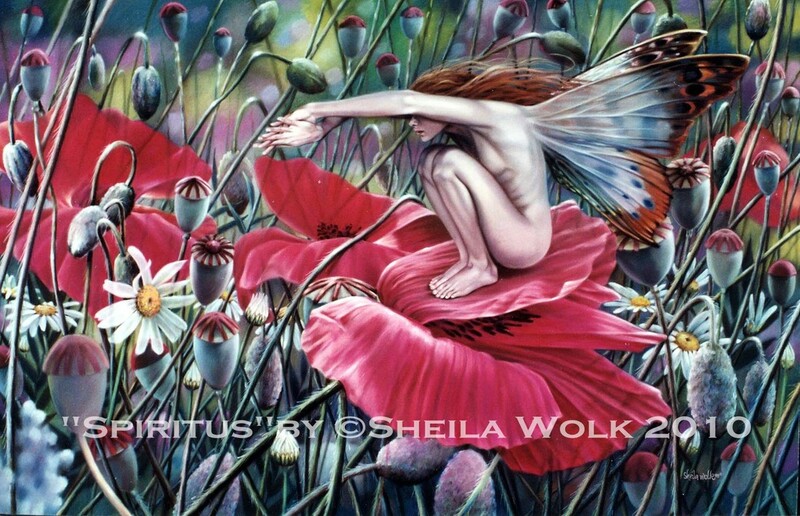 ​All paintings within this site are the sole copyright of Sheila Wolk© ​ and have been copyrighted with United States Copyright Bureau. All rights reserved including the right of reproduction in whole or in part in any form. My Artworks in image or text are not considered public domain!